A magnificent 1870's desk and bookcase has hand carved statues representing art and music plus classical satyr figures. 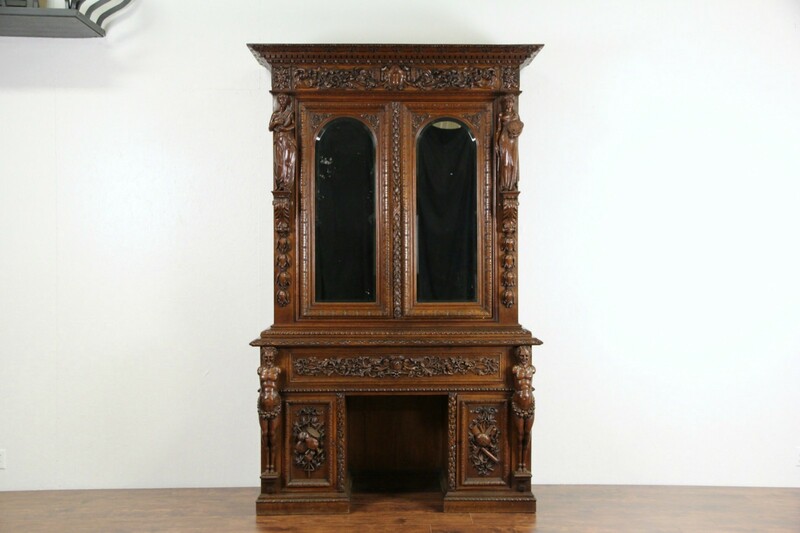 This palatial solid quarter sawn oak antique furniture from France is very well preserved and shows masterful artistry. Lower door panels are allegories of music and science, behind panels are drawers. One opens with a key as a handle, that lock does not work. The top of the base desk cabinet has been revarnished for durability. The rest of the finish is original, waxed and polished so that only an occasional wipe with a soft dry cloth is needed to maintain its warm patina. A key with a double throw lock opens the pull out desk, a pushbotton drops the front. The writing surface is inlaid with natural saddle leather. Locking upper doors have original arched and beveled mirrors, with a little "smoke" to show their age. Inside are adjustable book shelves. There are small shrinkage separations from age, see photos. Measurements are 64" wide, 26" deep, 8' 5 1/2" tall and the desktop is 28 1/2" high.